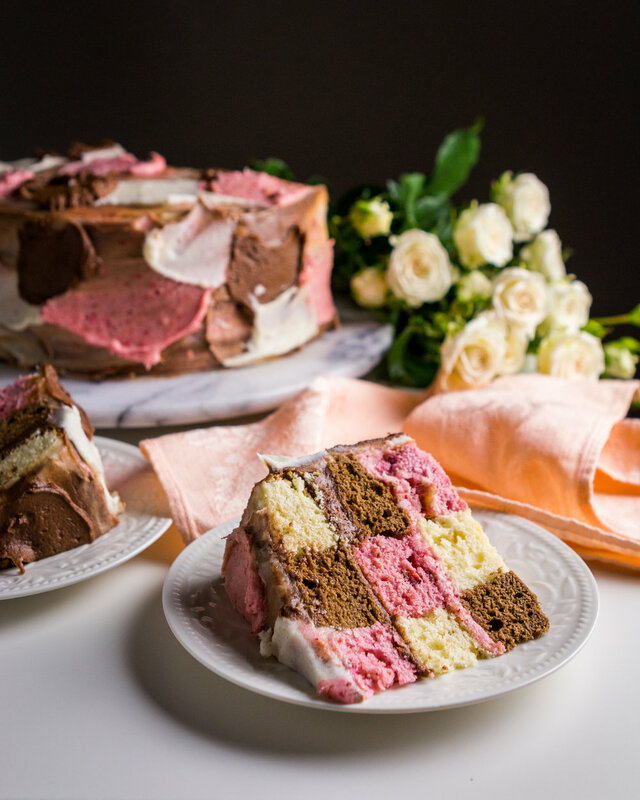 Neapolitan Checkered Cake — knead. bake. cook. I’ve had a vision of this Neapolitan Checkered Cake in my head ever since I made this Mint Chocolate Chip Checkered Cake. But since then, summer, fall, and the holidays came and went. As it is now near Valentine’s Day, I thought it would be the perfect time to write about this flavor of cake. I’m not really the biggest fan of Valentine’s Day but if it’s an excuse to make a cool cake then I’ll take it! I knew they would be perfect for a three layered checkered cake, since having those three different flavors/colors lends itself well to this pattern. 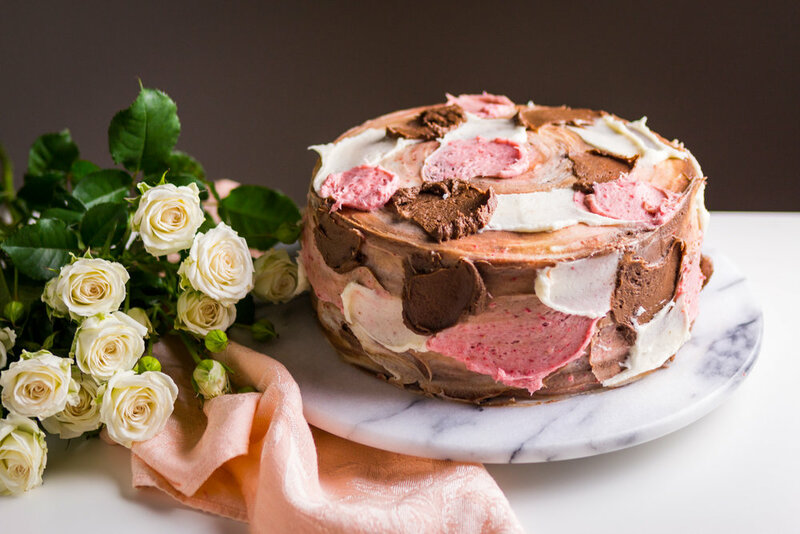 I chose both a cake and a frosting recipe that use one base vanilla recipe and allow you to just add chocolate and strawberry flavorings to create the other two flavors. Due to the nature of making checkered cakes, this recipe is for a denser cake to prevent the cake layers from falling apart when you are assembling them. But by all means, feel free to skip the checkered-making step if you don’t have the means to cut the cake rounds. It will still taste the same! And now I can’t wait until summer to eat some of the ice cream again. You can freeze the cake ahead of time. Simply bake it, let it cool and immediately wrap it in plastic wrap and store in a plastic bag until ready to use. The cake will keep like this for two months. If you don’t want to make this in a checkered version (except why not, because it is cool! ), simply stack each flavor on top of each other like you would for a normal layered cake. Also, feel free to frost as desired. The method below has a more artsy effect but if you want to do it another way, by all means! Puree strawberries which should result in a little over 1 cup. Stirring occasionally, simmer the puree over low-medium heat for 25-30 minutes until you're left with half or the puree coats the back of a spoon. Allow to cool completely before using in cake batter. You can make this the day before. Just cover and place in the refrigerator overnight. Also freezes well. Preheat oven to 350ºF. Grease and flour three 8" cake pans. Line with parchment and set aside. Melt the baking chocolate and let cool completely. In a large bowl, whip the egg whites until stiff peaks form and set aside. Mix and sift together the flour, baking powder and salt and set aside. Add flour in three portions and milk in two portions, alternating mixing until well blended before adding the next addition. Fold in the egg whites. Divide the batter into three equal portions. Add melted chocolate to one portion, reduced strawberry puree (if using) freeze dried strawberries and red food coloring (if desired) to the second portion and vanilla bean seeds to the third portion. 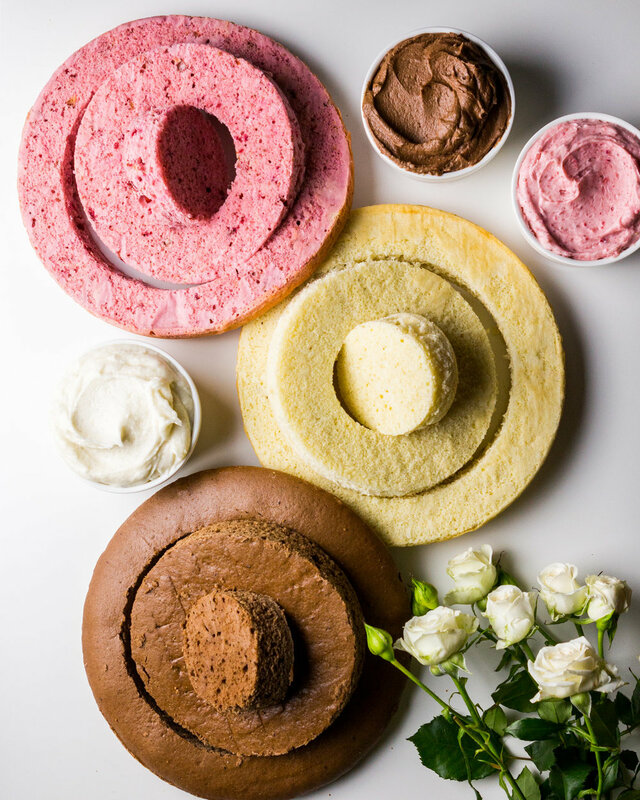 These are your chocolate, strawberry and vanilla cake flavors. Place each flavor in a separate cake pan. Bake for 12-15 minutes or until the cake bounces back to the touch and a cake tester comes out clean. Let cool in pans for 10 minutes and then invert on a cooling rack. At this point, when the cakes are completely cooled, you can freeze them. It is easier to cut them out to form the checkered pattern when they are cold so I usually freeze them overnight. In the bowl of a stand-up mixer with the paddle attachment, beat butter on medium speed until creamy, about 2 minutes. Add powdered sugar, heavy cream or milk, salt, and vanilla extract with the mixer running on low. Increase to high speed and beat for 3 full minutes. If frosting is too thick or thin, add a bit more heavy cream/milk or powdered sugar. Divide frosting into three equal portions. Fold the freeze-dried strawberries into one portion, cocoa powder into another, and vanilla bean seeds into the third. Cover tightly if not using right away. Place a 6" cookie cutter in the center of the chocolate cake round. Press firmly to cut cake. Now, with your 3" cookie cutter, repeat the same process. Repeat with the vanilla and strawberry cake rounds. You are basically creating a pattern that looks like three concentric circles or the Target logo. To form the checkered pattern, press together the outer ring of strawberry, middle ring of vanilla and inner ring of chocolate. Then, outer ring of chocolate, middle ring of strawberry and inner ring of vanilla. Lastly, outer ring of vanilla, middle ring of chocolate and inner ring of strawberry. Place the first complete cake round set on a cake stand or plate. Fill the middle with one cup of strawberry buttercream. Top with the second cake round. Fill the middle with one cup of chocolate buttercream. Top with the third cake round. Cover cake with a crumb coating of vanilla buttercream and chill in the refrigerator for 30 minutes. Remove the cake from the fridge and start covering the outside with alternating swashes of the three buttercream flavors. When finished, leave as desired or use a bench scraper to smooth and blend the three flavors. For more pop, add more swashes of the three frostings.